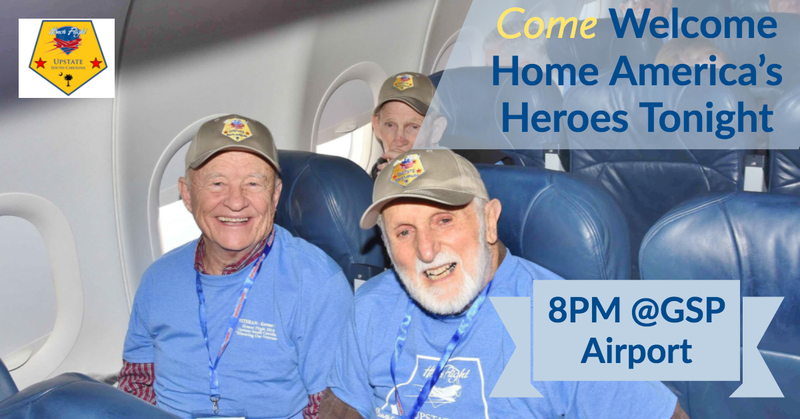 Support Honor Flight on Veteran’s Day! GREENVILLE- Wednesday, November 11, 2015. Today, Honor Flight pauses to say thank you to all veterans in Upstate South Carolina, and around our great nation. 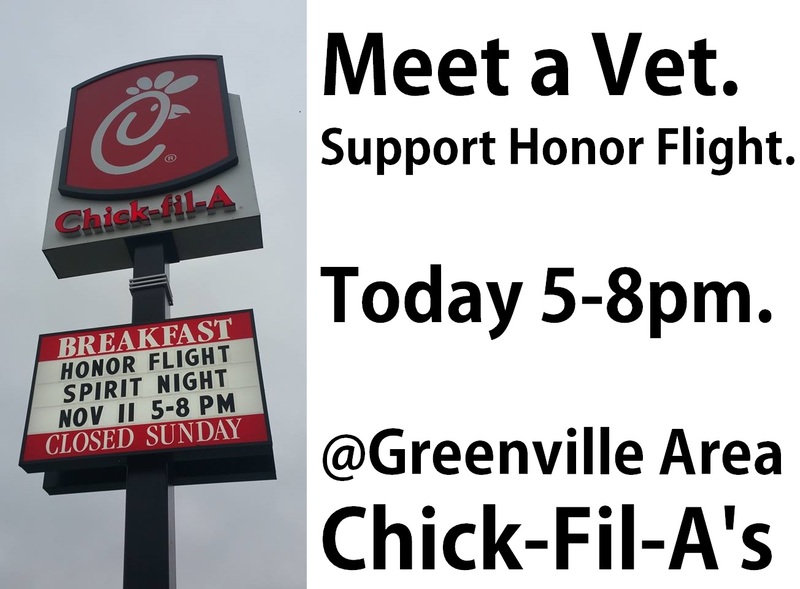 Partnering with Chick-Fil-A in all free standing locations around Greenville County, Honor Flight Upstate South Carolina will co-host veteran meet and greet opportunities for the public from 5pm until 8pm this evening. Customers of Chick-Fil-A will also be supporting the spring 2016 flight for WWII and Korean War veterans, as a percentage of sales at Chick-Fil-A will go toward a veteran’s flight. On October 29, 2015, a group of eighty-five WWII and Korean War veterans departed from Greenville-Spartanburg International Airport to Washington, D.C., on Honor Flight from Upstate South Carolina. These WWII and Korean War veterans were the special honorees of the fifteenth Honor Flight from Upstate South Carolina. The group, accompanied by nearly one hundred guardians, doctors, nurses, support staff, and media, visited the World War II and Korean War Memorials, in addition to viewing the changing of the guard at the Tomb of the Unknowns at Arlington National Cemetery. Honor Flight Upstate South Carolina is a non-profit, volunteer-based organization that is dedicated to honoring our WWII and Korean War veterans, and the many sacrifices they have made to keep our nation safe and our people free. Veterans, who have never had the opportunity to see the memorials due to physical or financial limitations, are invited to apply for upcoming flights. There is no cost to the veteran to participate in this worthwhile program. It is extremely important to extend this opportunity in a timely manner to all interested veterans as they range in age from the 70’s to over 100 years old. Time has never been shorter for us to say thank you to our WWII and Korean War veterans. Donations go directly to costs associated with taking a veteran on this experience of a lifetime. For more information on how to get involved, make a donation or apply as a guardian or veteran, visit www.honorflightupstatesc.com or call 864-869-VETS.